I hadn’t really planned my visit well enough it seems. I came to Cambodia at the beginning of April and I learned that this is one of the hottest time here. I have trouble staying hydrated in the best of conditions. In Cambodia, this became almost impossible. I did try. I carried a bottle with me all the time. I forced myself to drink from it even when I wasn’t thirsty. It wasn’t enough and soon it became worrisome. I know no one wants to hear urine talk, but somehow I feel I can’t avoid it. Urine can be a good indicator of severe dehydration and dehydration is something we all face at one point or another of our travels. In my case, as my days in Cambodia went by, I noticed my my urine got darker and darker, until finally it got to be a very dark shade of brown and I couldn’t ignore it any longer. I realized that I might just have to go to the hospital. I don’t really like hospitals and I didn’t really feel confident about hospitals here. So, being pigheaded as I tend to be, I gave myself one day to either somehow manage to improve things or head to the hospital. Thankfully, the rooms in my hostel had AC. Not very strong AC, but AC none the less. The rooms were still hot, but it was better than being out there in the sun. So I spent one day inside, forcing myself to drink as much water as I could and taking cold showers to cool off. I rested the rest of the time. Then, the next morning I noticed the color had paled a bit. So I decided to venture outside in the morning and come back at noon to spend the hottest part of the day in the AC. Then at night, I would venture out again. I really calculated my water intake and forced myself to drink every half an hour. By doing this, I did manage to solve the problem. However, I fully realize this was a very close call for me. 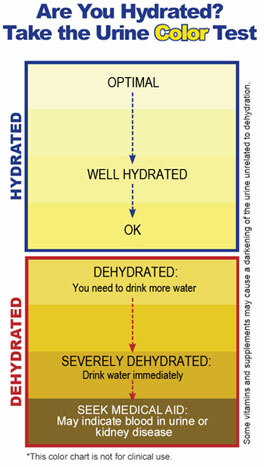 Another good sign of dehydration is the lack of urine. That is one thing I experienced for two days in the Australian Outback (again I was there during the middle of their summer). That time I did drink a lot of water, it just wasn’t quite enough. It is said you have to drink one liter per hour when you are in the desert. Why was I less worried that time in the desert? First, everybody in my group was the same. Second, I knew I had very limited time in the heat. Finally, I didn’t have any other symptoms, I felt perfectly fine. For Cambodia, I knew I was going to remain in those conditions for a while, long enough for it to become a problem. Next, I did feel lethargic and nauseous. To tell you the truth, my body just felt wrong. To me these were other indicators that it was not to be taken lightly and part of the reasons why I was considering seeking medical attention. You should never overlook hydration, which I know can be quite easy when you travel. As my guide in the Outback of Australia used to say, if you feel thirsty, you are already dehydrated.